Yet inspiring is exactly how we would describe “Expanding Minds,” the weekly show on the Progressive Radio Network hosted by D’Aoust and author Erik Davis (who, we can never resist mentioning, is our single favorite living author) that we’ve listened to religiously for the past couple of years. Dedicated to exploring “the cultures of consciousness,” the program is the closest thing we have to guaranteed revelation, each episode promising – and delivering – intense, informative, intriguing and, yes, inspiring conversations with some of the brightest minds from the worlds of magic, spirituality, psychology and technology. Left in less capable hands, these conversations also hold the potential to veer towards the dry and painfully academic or, perhaps worse, the boring and ill-informed. But this might be the most magical thing about the duo of Davis and D’Aoust: that absolutely never happens. Davis – author of such must-read books as “TechGnosis,” “The Visionary State,” and “Nomad Codes” – was a known entity to us even as the podcast began its run. 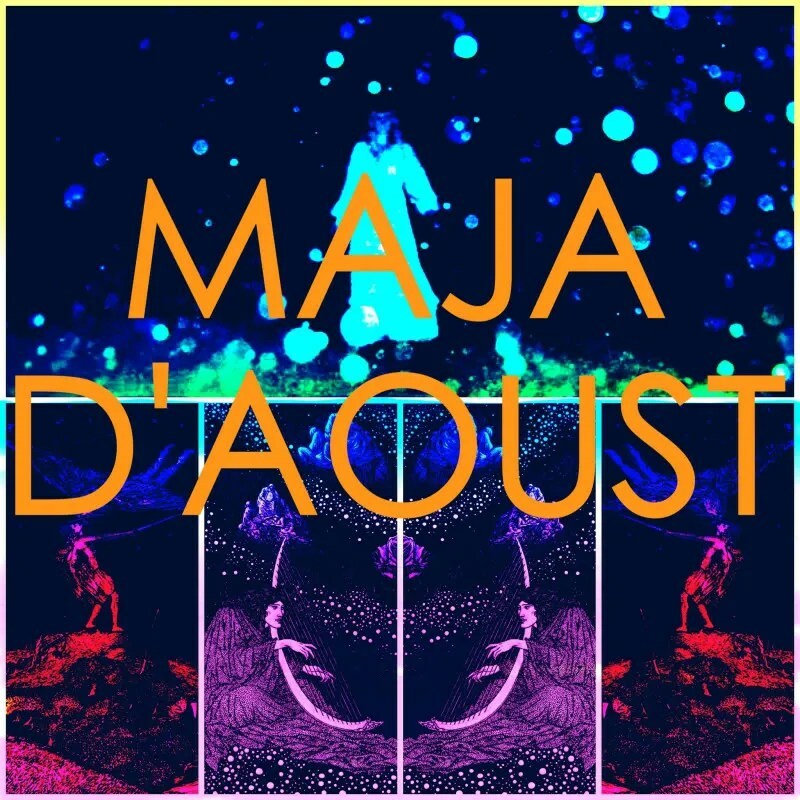 D’Aoust, however, was completely off of our radar. Who was this woman with the uncommon name, and the even more uncommon ability to converse with grace and humor about both ancient tantric tradition and contemporary brain science? Who is equally comfortable discussing Ravi Shankar as she is High on Fire? Who seems to know the origin – and thus the deeper meaning – of every word in the dictionary (and surely a few that have been left out)? We couldn’t die wondering , we couldn’t be happier to have been introduced to D’Aoust, and we certainly couldn’t be more thrilled to share her answers to our ridiculous questions below. Enjoy (and keep your minds open). We listened with great enthusiasm to your enlightening lecture entitled “Music and Magic,” wherein you early on assert that the most ancient forms of magic, notably shamanism, used music and songs as the mechanism to effect change (magic here defined as “the ability to perceive connections and influence through connection”). How do you see this notion manifest itself in the world around us today? Where do you see the biggest impact of this magic/music connection in relation to the music being created today, or the music of perhaps the past forty to fifty years? What current examples do we have of this mechanism being employed with intent? Are there current examples of ways in which you see this magic/music mechanism being employed without conscious thought (or, in the immortal, blunt and pejorative words of King Diamond, “Oh, they should have known / not to play with the powers of hell”)? The manifestation of the invoking power of music in the world today is prevalent everywhere. I mean, how much influence has the music you have listened to had in your life? The power that music holds over people formulates their entire outer image in many cases. Look at high school – there will usually be the person who looks JUST LIKE one of the Ramones, the hesher who wants to look just like James Hetfield, the emo dude who looks like Morrissey. The musicians actually influence their listeners to want to BECOME THEM. Now, you could of course say this is not done on purpose by the musician, but tell that to all of the people who run around with their faces painted like Ziggy Stardust. The most perceptible way in which we can actually see this with our eyeballs is to look at all the people at a concert who try to look exactly like the musician they are there to see. Many bands, or musicians, get what is called a “cult” following in which the devotees see them pretty much like a form of religious experience, or like going to church (The Grateful Dead obviously being the peak of this, with a traveling commune that surrounded them). Because music has the ability to open a “magic” perception, it can very well be one of the best mechanisms for inducing altered, or ecstatic, states, and this opens a space to have a mystical experience. In terms of a musician using conscious intent to perform such a feat, apart from King Diamond of course, there are too many to list … but you could start with Jay to Z. Continuing on the theme of music and magic for another moment, we’d love to know what your impressions or direct experiences are with the intersection of music and magic during your adolescence. We grew up during the height of the “Satanic Panic” of the 1980’s, wherein the most comically unserious and unthreatening bands (Kiss, Venom, Judas Priest) were accused of being only a few degrees shy of Charles Manson. Later, we became involved and obsessed with the early death and black metal scenes, wherein many of the artists actually were dangerous and committed to “satanic” ideals. When did you first become awakened to the power of the music/magic connection, both from the standpoint of the connection being used as a bit of shtick and from the standpoint of the connection being very real and often very powerful? And “shtick” is a kabbalah word, right? Haha … wellllll, you are talking to a girl who was obsessed with metal as an adolescent so, I too had a run in with the “Satanic Panic.” When I was in 7th grade, Metallica’s “… And Justice for All” came out, and it was in my Sony walkman for the whole year. From there it went to Sabbath, “Bark at the Moon,” Anthrax, Pantera, etc., all the while my art skills were developing and I constantly drew devils, angels and massive battles between them. I received a lot of criticism and comments for my preferences in this area, and more than a few dirty looks for my “Damage, Inc.” patch on my jean jacket. To this DAY I get accused of being satanic, but that is just because some people’s minds are too small to contain the word “witch” in any other place than one of fear and ignorance. Mind you, I was in the middle of the woods at this time also, living on a small hippy island where my friends and I would hang out in the forest, like the middle of the forest. So I can easily say, if you would like to open a magic portal, put on some metal, and go into the woods. It’s kind of like a duck call for the pagan gods. In terms of shtick, my first confrontation with the “power” of shtick was in high school – my friend came over to a table of friends at lunch and told us that he went to see a band called “GWAR.” “What the hell is GWAR?,” we all asked innocently. In response, he reached into his backpack and pulled out a mass of hair with blood on it – it had been attached to his boot when he left the show. “A souvenir,” he said. Just because something is shticky, doesn’t mean it’s not real. As real as a scalp on yer’ boot. What is your impression of the conventional wisdom held on the topic of magic by the general population writ large, to the extent that there is one? What is the most common misconception about magic that you encounter, both from those utterly opposed to and frightened by it, and by those who, at least nominally, claim to support and/or understand it? My favorite thing that people say to me is, “I don’t believe in magic,” or, “I don’t think your beliefs are true.” The biggest misconception about magic is that it is religious dogma, when in fact, Magic is more like Science than anything – nearly ALL of our scientific systems come from magical practices … astronomy from astrology, chemistry and medicine from alchemy, pharmacy (which actually means “sorcery”) comes from shamanism … DNA was discovered in an LSD-induced state, for crying out loud. You don’t have to BELIEVE in magic any more than you have to BELIEVE in the ocean. You can just go take a swim. Just do magic and see what happens. Magic is about developing your awareness to greater capacities to see reality that might otherwise be hidden, like a microscope. And it’s not that shocking to learn, the only reason we have microscopes is because the ancient Egyptian Alchemists were messing around with lenses and figuring it out. Take a look at some of your favorite scientists – many of them were studying the old magicians. Isaac Newton, when not writing the “Principia Mathematica,” was an avid astrologer and alchemist. Niels Bohr based his model of the atom on the harmony of the spheres (kabbalistic). Wolfgang Pauli figured out the exclusion principle from esoteric music studies. It doesn’t take a rocket scientist (p.s. JACK PARSONS – who invented rocket fuel – did occult magic) to see that Magic isn’t just about believing in ghosts. It is about the laws of the universe, and the force that pervades all things. What methods do you employ to keep yourself from stagnating when it comes to the evolution of your own personal relationship with magic, esoteric thought and transpersonal psychology? Do you think you were born equipped with a natural sense of curiosity with regard to these topics, or is it something that you feel was fueled by very specific encounters or experiences? Yes, I have lived in freaky magic town my whole life. I can remember supernatural experiences from when I was two years old. The biggest danger for me with my magical practices is clearing and cleansing. I work with people everyday in a magical capacity through divination. Because my memory is ridiculous, I can remember the exact tarot spread of a client who may have come to me 2 years ago. If I can’t clear out, I can easily become a tragedy battery, storing all the sins that people give me to eat through the course of the session. Because I work through contagious or sympathetic magic, I open completely during a reading and so I take everything in. If I don’t have proper elimination, I suffer physically. So, Nature gives me a sickness, or a crisis to make sure I get it out. That really is my biggest concern, otherwise, I get hit by amazing, off the hook synchronicities, miracles and awe-inspiring events almost everyday … THANK GOODNESS!! So, yes, I am fueled by experiences, experiences which undeniably flip my wig to keep me on my toes. One such example: going to Santa Cruz forest with some friends, in the car on the way there I said aloud, “Maybe we will see a salamander.” Which was weird, because we weren’t by the water – we were in the woods. Everyone thought it was weird, and I had never “hoped” to see a salamander before … sure enough, about ten minutes into the hike, my friend stopped and turned to look at me with her face pale. She just pointed, there on the exact center of the trail, staring us right in the eye was a bright, flaming-red salamander. In what way – if any – did becoming a parent yourself alter your impression of magic, your impression of humanity, your impression of yourself? What do you find the most challenging aspect of being a mother? What aspect do you find to be the most rewarding? Throughout the process of incubating my Homunculi, I never ceased to be amazed at the supremely strange and utterly primal nature evoked in being “a mother.” You are never more of an animal than when you are giving birth and feeding from your breast. A LARGE part of my soul was awakened with the birth of my children, and they have a huge effect on my magical nature. Firstly, they ARE magical, there is no resistance in their minds, and children see magic automatically, without interference. Secondly, through the actions of humility, service, sacrifice and patience involved in being a parent, any magician is sure to get closer to the higher forms of magic than the lower. This is also possible to achieve without children, but you have to actually engage with and help others in the form of service. It is one thing to be a magician on your own, in your basement, and never interact with another human being, but it quite another to attempt to bring it into the world and engage. The most challenging aspect of being a mother for me is remembering temperance. The most rewarding is the laughing, laughing, laughing. In both your lectures and in your writing (as evidenced within your sensational thesis, “Dis-Inheriting The Sins of Our Fathers,”), you display a true fascination with and fluency with etymology, using word origin to further illuminate many fascinating discussions. Where do you think this impulse stems from? Have you always been interested in word origin? What authors most directly capture your own imagination with their creative use of words? What book on your bookshelf do you think some people would be most surprised to find, and most surprised to hear how deeply moved by it you were? I come from a long line of literary women. My grandmother had me memorizing Edgar Allan Poe when I was seven years old. My mother had me knee-deep in books while I was still in her belly. The word-chasing really started when I began investigating the meaning of my own name, and found ridiculously delightful significance for me as I unearthed its history. After that, it was on. Words really are codes that contain DNA for the thing they are talking about. Language could possibly be one of the biggest mysteries ever and I find the more I get into it deeply, the more awe-inspired I become. But it goes a bit further than that I must confess – I am a source seeker of most things. I HAVE to know where things come from, because that tells you more about what they are. As a species, human beings really don’t know our own origin stories – we can’t even remember our own births – so trying to hunt down where things come from can help you to get closer to solving your own origin by proxy. Plus, I think I am just kind of naturally Nancy Drew-ish. Books, man. I have read, maybe, tens of thousands of books, I think. Some of my favorite prose is Thomas Wolfe’s “Look Homeward Angel,” Robert E. Howard, Ray Bradbury, the romantic poets kill me, Percy Shelley is a long-lost soul mate for sure … as well as Charles Baudelaire … Langston Hughes is like lava to me. How did you first meet your co-host on the “Expanding Minds” podcast, Erik Davis? What is the most compelling thing you have learned about yourself from the time you’ve spent with him? What is the most compelling part of being a part of this podcast for yourself personally? I love Erik!! He is one of my favorite people on earth. I first met Erik at a salon at my good friends Adam Parfrey and Jodi Willie’s home. He was giving a presentation on his book, “Visionary State,” which is epic and beautiful. We started chit chatting on and off after that and found we were kindred spirits. I have learned lots of things about myself spending time with Erik. I find all of our discussions go to great places that I can’t always access with other people. He truly has an expanded mind, so he can flow along without resistance to lots of topics. In that way, I think he has helped my mind grow immensely, by simply opening. In terms of being on the show, it is like my weekly candy. I get to talk to AMAZING people and laugh and have fun and get smarter. All of my favorite things!! What music have you been listening to lately? Can you identify one album or song that you consider as having a direct impact on your spiritual evolution (for lack of a more cloying term)? Have you ever heard the early 70’s glam rock pioneers from the mystical land of Orlando, Florida, known as White Witch? Is there a more popular occult song ever writing than The Lovin’ Spoonful’s “Do You Believe In Magic”? Ahhhhhh, music is SO big to me … that is tricky to answer. Lately, it has been a shuffle of the Smithsonian “Anthology of American Folk Music” anthology, Tool’s “Lateralus,” Ides of Gemini’s new album, “Constantinople,” Mahalia Jackson, John Fahey … for this month anyway. ONE song that impacted me greatly spiritually and can still take me to a place pretty quickly is Nina Simone’s cover of the George Harrison song, “Isn’t It a Pity?”. Well, really, Nina Simone assassinates me with everything. I watch her YouTube performances and my soul rises up to try to give her a high-five. I have so MANY amazing musicians in my community that constantly inspire me. I love all the folks who I have met, like Lavender Diamond, The Entrance Band, White Magic, Jefferttitti’s Nile, Nora Keyes, Diva, The Silver Chords, Daniel Brummel, Featherbeard and so many more … I could be shoutin’ out alllll day. Haha! I have indeed heard of White Witch – my good friend Jodi Willie (who made The Source Family documentary) brought that album to my attention and I must say, it’s pretty good. I am always down for some good 70’s rock. And I think “Season of the Witch” might give The Lovin’ Spoonful a run for their money, but it’s a close call. Haha … well, firstly I have to say, as stated above, science comes from magic. And as far as scientific empirical tests … according to those, the radiation leaking out of Fukishima is perfectly safe. So we all know how far that goes. Obviously, I don’t HATE science – I LOVE science. But people need to understand it is not infallible – just ask Karl Popper. But, yes, the good thing about Magic is you can actually DO IT. You can feel it. It is palpable, present and effective. All you have to do is put your mind to it, say some words, and let it go.